Diddy and I both do this before bed. And it's changed my life. It began about a month ago. Cold temperatures meant that I had the heater on full blast. An unintended side effect was extremely dry air. The job of any good heater, or AC unit, is to control humidity. This isn't a bad thing during summer. But, when humidity levels are already low, plucking what's left of it out of the air is disastrous for the skin. There were nights when I'd wake up extremely uncomfortable. I thought that removing layers of clothing was the solution to help improve my rest. But that wasn't the answer. What I was dealing with was an onset of dehydration as I slept. And it was pretty bad. To solve the problem, I implemented a simple solution and have experienced a multitude of benefits ever since. Around that same time, I was brainstorming small actions I could take, that created the feeling of abundance. 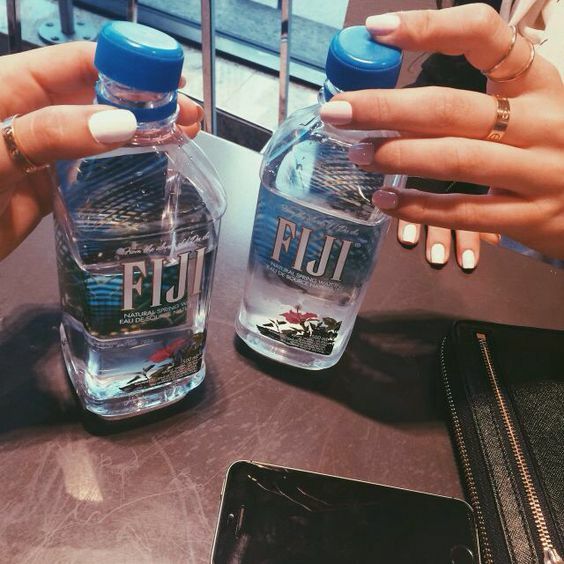 One easy idea that came to mind was to purchase a pack of those small 500ml Fiji Water bottles. I'd proudly display them in my newly organized fridge kinda like a celebrity filming an episode of MTV Cribs. I thought bought those mineral waters were for show, but they ended up helping me create a new habit which has paid off big time. Whenever I'd wake up feeling parched, I'd quickly down a full bottle and doze right back to sleep. I did that for a few days back to back. Each time I'd awaken, I'd simply reach for the little bottle sitting next to my bed. Within a few days, I decided to take a more preemptive approach and drink a bottle prior to bed. Doing so prevented me from waking up seeking rehydration. It wasn't long before I noticed additional benefits. The first, and most obvious is how much drinking water at night stimulated my digestion. Every time I drank ample amounts of water either before bed or during the night, I noticed the positive impact to my digestion. I also woke up feeling well rested and ready to take on the new day. Once I implemented my "nightly hydration routine," my excessive seasonal dryness seemed to go away. For instance, my scalp dermatitis always flares up this time of year, but hydrating before bed seemed to make a huge difference. The skin on my face also isn't as dry. From an internal perspective, drinking adequate amounts of water before bed can benefit your body in so many ways. We all know that while we're asleep, our internal system is wide awake, working diligently. Especially the functions of our body responsible for cleansing and detox. It makes sense to supply our bodies with the fuel it needs to properly conduct an overnight cleanse. Yes, drinking more water before bed might mean extra trips to the restroom at night. But after being consistent, my body sorta got used to it and now I sleep through the night even if I drink prior to bed. Also drinking before bed doesn't necessarily mean guzzling down water right before you hit the sack. I just make sure to up my water intake at least an hour or so before bed. This gives me time to use the restroom prior to falling asleep. The other day, I was reading about Diddy's nightly beauty routine. It turns out that he too consumes a large bottle of water prior to calling it a night. He's a businessman who needs to wake up ready to tackle a new day, even after a night of partying. Keeping your body hydrated while you sleep is a surefire way to make sure you don't skip a beat. I also read online that pre-sleep hydration will help you wake up earlier. If you don't wake up overnight to use the restroom, your body will send the signal to you early morning. For those of you who have trouble waking up early, you might want to give this a try. You don't have to use Fiji brand but I like these because of their mineral content. I'm drinking them for somewhat therapeutic reasons. I think the mineral & silica content provides internal health and beauty benefits beyond tap water. This is now officially a part of my daily detox routine. I don't have a solid nightly beauty routine in place yet but I'm building one starting from the ground up. First I focus on the internal beautification then work on the external. Definitely going to give this a try. Thanks for the tip! i've noticed this too, if I wake up in the middle of the night, having some water to drink always makes going back to sleep so much easier! thanks for sharing.